Apart from the many problems of dampness caused by actual structural defects or uncommon site circumstances such as an underground stream for example, there is one, which, under certain circumstances, can be common to all buildings. This form of dampness is condensation, which may be associated with a general surface wetting of an isolated area, and which might be mistaken for external water penetration. It is easy to conclude that there is a leak on a window frame for example, when a morning water puddle on a windowsill is in fact moisture condensed from within the atmosphere of the room. 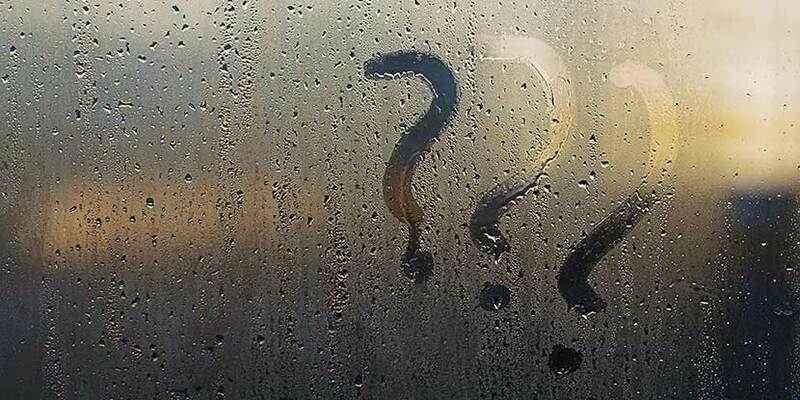 Perhaps the most common form of condensation that we are familiar with is that of steamed up windows, which is experienced during winter conditions when internal temperatures and humidity are high, and external temperatures are low. In order to deal effectively with this problem it is advisable to understand the basic cause of the phenomena, and then apply that theory to your own practical scenario to see what modifications you could make to achieve relative freedom from condensation. It is well known that our atmosphere contains moisture in vapour form, but it is not generally understood that the warmer the air the greater the quantity of moisture it can contain. However, should warm air containing a high moisture content come into contact with cold air or a cold surface, a dew point is reached and the reduced temperature causes some of the moisture to be condensed into water. It is possible, if equipment is available to ascertain certain factors to provide a basis for calculation, to establish at what point, under any given circumstances, condensation will occur. This equipment is called a Hygrometer, and will not normally be in the hands of the householder, but as a matter of interest here is a hypothetical instance to make this problem more easily understood. The moisture that exists in the air is generally referred to as the relative humidity (RH) and is considered to be a percentage of saturation where 100% is saturation point. Thus the RH at any given temperature indicates the quantity of moisture present at that moment. Any lowering of the air temperature will increase the RH until eventually if the temperature is sufficiently lowered, then saturation will be reached and any reduction below this point will cause a dew point, and moisture in liquid form as water will appear. I have a Hygrometer, which measures RH, and to reset this it is accepted practice to wrap a hygrometer in a wet towel, where within half hour the needle should point to 100%. It must not be assumed that RH is a static level of moisture and it should be appreciated that changes will occur to the RH as air temperatures change. For example, if we have an air temperature of 60 ° F and a RH of 70%, if this air temperature was lowered 52°F, this would produce a RH of 100%. Without alteration of the air temperature, or window and wall surface temperatures, but increasing the air moisture content i.e. filling a bath without first introducing sufficient heat into the room to warm the air and walls. The sudden lowering of the temperature of the wall or window surfaces, i.e., the effect of freezing external air on a window when internal temperatures and air moistures and air moisture content remain unchanged. The rise in air temperature and air moisture content without increasing the wall or window temperature, i.e., boiling saucepans or drying clothes. The above is the theory relating to the cause of condensation, but what of its effect? Generally when condensation is slight, a darkening of the wall surfaces, buckling of wall paper or ‘steaming up’ of windows will occur, and under such conditions it could be estimated that as soon as adequate warming of the affected surfaces occurs, a complete return to normal dry conditions will take place. Dense brick or masonry walls take some time to warm up, thus an immediate increase in air heat could result in absorption of more air moisture and may cause an immediate increase of moisture deposited but as the walls warm, evaporation will take place and soon the normal dry appearance will return. More severe condensation may occur where surfaces are sufficiently wetted taking several days to dry out. In such instances some damage may occur. Stains on decorations can develop, timber may swell due to the moisture absorbed or a mould growth may be promoted with accompanying musty smell. Serious condensation where water actually runs does not occur very often in domestic property, but we are aware of the intermittent ‘running water’ experienced in such instances as bathrooms and kitchens with glazed wall tile surfaces, cold water service pipes, china cisterns and window or roof glazing. If such occurrences are infrequent, drying may take place without causing any damage, but where vertical surfaces are encountered the continuous formation of condensation may run down and cause such severe wetting of the structure receiving the water that deterioration may take place. A cold water pipe, for instance, passing though a floor could cause sufficient saturation to bring about timber decay. A cold-water storage tank in a roof may result in condensation dripping on to the ceiling and giving rise to a water stain the same way as a straightforward roof leak. Glazed tiles may shed moisture on to a timber floor and result in decay of the flooring. Heavy condensation on single glazed wood windows may percolate into the joints causing the paint to crack and eventually shell off. There are more obscure reasons for condensation to form such as a layer of impervious paint under wallpaper and instances of ‘rising dampness’ have been reported which have defied considerable effort to eradicate. This ‘rising dampness’ after careful inspection has been revealed to be condensation caused by the encroachment of paint from the skirting on to the plaster wall. The natural absorbency of plaster at this point is shielded and condensation formed readily on the impervious layer of paint with the subsequent wetting of the paper layer above. Continuous formation of such condensation of absorbed by the paper and an area of several inches, as a strip along the top of the timber skirting will appear simulating rising dampness. Removal of the encroaching paint to restore the absorbency of the plaster layer has often saved much trouble in tracing a structural fault. Similarly, an area of paint beneath the paper where a brush has been ‘rubbed out’ prior to cleaning after painting could cause a small damp patch. We now have the cause and in some measure the effect of condensation on the structure. It now remains to see what a householder can do to overcome the problem. As we have seen, very mild attacks of condensation can be ignored or simple experiments in heating and control of kitchen and bathroom steam and increased ventilation can make. Perhaps the largest percentage of slight dampness due to condensation is due to leaving a kitchen door open when cooking, or not ventilating a bathroom following use. The heavily laden atmosphere is allowed to permeate the whole house and cause condensation on any cold surface with which it comes into contact. It is not always possible or even desirable to go into ‘solitary confinement’ in order to prepare a meal, or do the laundry or have a shower. Therefore adequate ventilation of the saturated areas is a necessary consideration to carry away the excess moisture to the outside to alleviate the possibility of self-induced high moisture contents within the home. More serious condensation needs modification beyond the simple methods mentioned above, but since warm surfaces and a control where possible of atmospheric moisture are the basic remedial measures it is safe to start at this point before going into large scale undertakings. In areas where impervious surfaces such as wall tiles exist, continuous heating may be necessary to prevent cold walls. Additional thermal insulation by the use of battens treated with wood preservative and fixed to the wall over which a wall surfacing into the cavity would considerably reduce the tendency for severe condensation to occur. This material is more readily adjusted to the air temperature, and if the absorbent character of the plasterboard is allowed to remain by decorating with emulsions paints or wallpapers, it will not show the presence of moisture unless conditions are very severe. If, however, it is given a coat of gloss paint it may show moisture for a short period, but as it warms this moisture will evaporate. We now see that controlled air moisture where possible, combined with comparatively warmer surfaces which are absorbent and have good thermal insulation are the best measures for controlling condensation, but in keeping with this an even, warmer temperature should be achieved if possible. It is not always possible to achieve these properties, for instance, a cold water pipe would need wrapping with absorbent materials to increase insulation, but vapour would still pass through this material and condense on the pipe beneath. These measures would not completely eliminate moisture vapour from a cold surface, but again any reduction in the quantity of vapour gaining access to the cold surface will reduce the formation of condensation. Windows present a difficult problem and years ago there used to be only one practical means of dealing with the traditional domestic window. This usually took the form of collecting the water forming in a channel at the bottom of the window and leading it via ‘weep holes’ to the external face. These ‘weep-holes’ or condensation outlets are small holes about 1/4″ in diameter drilled at an angle through the frame so that water will pass by normal gravitation to the outside. It was preferable to have a small copper tube passing though a timber frame so as to prevent a tendency for saturation to take place, The easy answer these days to alleviate window condensation is with sealed double-glazing, and normally with PVC-U frames. The insulation properties of both framework and glass is improving all the time as technology moves on, and as measures are introduced by government to improve energy efficiency in line with the Kyoto Protocol. Glass is still glass, and no matter how well insulated by double-glazing, the interior pane will always be susceptible to the formation of condensation in a situation where the RH reaches impossible limits. Many questions are asked as to whether increased ventilation would cure condensation, and in most cases this is the most important keyword. In most instances judicious ventilation will help to overcome the problem since it will encourage rapid evaporation of a condensate. However, with increased ventilation may come a tendency for surfaces to become cooled. This is brought about by the air stream passing across the surface of the wall and bringing about the process of cooling by evaporation. The introduction of mechanical ventilation in the form of electric extractor fans can achieve some benefit if they are sited in such a position that humid air will be extracted, but care should be taken to see that it does not extract too much heat from the room, or indeed introduce cold air from outdoors when off. The presence of dampness from condensation can promote mould growth. Such vegetable life can exist beneath a paint film and erupt or destroy the decorative surface. Where condensation is cured, an effort should be made to reduce the mould growth by means of sterilisation. Normally a wash or scrub of small areas with an old toothbrush with a 50% Bleach/50% Water mix will be sufficient to kill off spores that are no longer being fed. Fungicidal chemicals are also available from most DIY shops. Finally, one form of condensation, which is not very evident, is that which occurs within the body of a wall. This is known as interstitial condensation. This is still condensation, but of a type which forms where the external influence of the atmosphere overcomes the internal heating influence, thus causing moisture to form in the same way that it will form on an exposed surface. This is a difficult form of condensation to control but the adjusting of humidity conditions is often sufficient. The incorporation of vapour-proof barriers as an inter-layer is about the only method of achieving complete immunity, but that is really two wrongs to make a right. The effect of applying external water proofing solutions cannot be relied upon as a cure for condensation. In certain circumstances, however, such material may have some merit in preventing a wall from becoming saturated by rain, which will in turn increase, its thermal insulation value to some extent. Where condensation is very mild, this slight increase in thermal insulation due to maintenance of a dry wall may just turn the balance in favour of prevention. It should not however, be relied upon as a means of eliminating the problem. If condensation in your home is proving impossible to control by consideration of all the above information I suggest you employ the services of an F.R.I.C.S. surveyor, you never know, you may have an underground stream below causing all your problems, but I think it unlikely, so re-read this article before paying out for expert on-site advice of this kind. It has been said that if one family and another family live as neighbours in a pair of semi-detached houses, and one family has bad condensation and the other does not; if they swapped homes and moved into each others houses, the sufferers would take their condensation problems with them – think about it! Denis Windows offer the best installation service.